The cross section of neutrino-induced neutral-current coherent π0 production on a carbon-dominated target is measured in the NOvA near detector. This measurement uses a narrow-band neutrino beam with the average neutrino energy of 2.7 GeV, which is of interest to the ongoing and future long-baseline neutrino oscillation experiments. The measured, flux-averaged cross section is σ = 14.0 ± 0.9 (stat.) ± 2.1 (syst. )×10−40 cm2/nucleus, consistent with model prediction. This result is the most precise measurement of neutral-current coherent π0 production in the few-GeV neutrino energy region. We present updated results from the NOvA experiment for νμ→ νμ and νμ→ νe oscillations from an exposure of 8.85×1020 protons on target, which represents an increase of 46% compared to our previous publication. 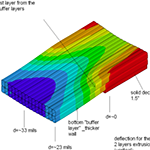 The results utilize significant improvements in both the simulations and analysis of the data. A joint fit to the data for νμ disappearance and νe appearance gives the best fit point as normal mass hierarchy, Δm232 = 2.44×10-3 eV2/c4, sin2θ23 = 0.56, and δCP = 1.21π. The 68.3% confidence intervals in the normal mass hierarchy are Δm232 ∈ [2.37,2.52]×10−3eV2/c4, sin2θ23 ∈ [0.43,0.51] ∪ [0.52,0.60], and δCP ∈ [0,0.12π] ∪ [0.91π,2π]. 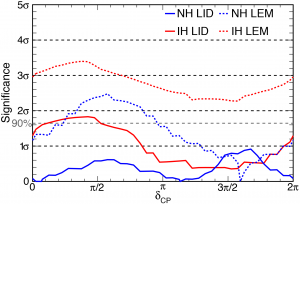 The inverted mass hierarchy is disfavored at the 95% confidence level for all choices of the other oscillation parameters. We report results from the first search for sterile neutrinos mixing with active neutrinos through a reduction in the rate of neutral-current interactions over a baseline of 810 km between the NOvA detectors. Analyzing a 14-kton detector equivalent exposure of 6.05×1020 protons-on-target in the NuMI beam at Fermilab, we observe 95 neutral-current candidates at the Far Detector compared with 83.5 ± 9.7(stat.) ± 9.4(syst.) events predicted assuming mixing only occurs between active neutrino species. 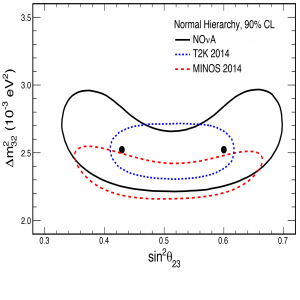 No evidence for νμ→ νs transitions is found. Interpreting these results within a 3+1 model, we place constraints on the mixing angles θ24 < 20.8∘ and θ34 < 31.2∘ at the 90% C.L. for 0.05 eV2 ≤ Δm241 ≤ 0.5 eV2, the range of mass splittings that produce no significant oscillations over the Near Detector baseline. Results are reported from an improved measurement of νμ→ νe transitions by the NOvA experiment. Using an exposure equivalent to 6.05×1020 protons-on-target 33 νe candidates were observed with a background of 8.2 ± 0.8 (syst.). 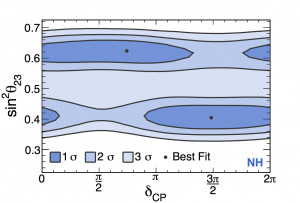 Combined with the latest NOvA νμ disappearance data and external constraints from reactor experiments on sin22θ13, the hypothesis of inverted mass hierarchy with θ23 in the lower octant is disfavored at greater than 93% C.L. for all values of δCP. 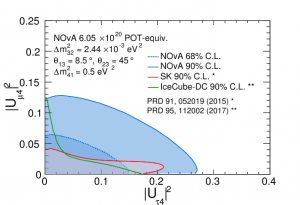 This Letter reports new results on muon neutrino disappearance from NOvA, using a 14 kton detector equivalent exposure 6.05 x 1020 protons on target from the NuMI beam at the Fermi National Accelerator Laboratory. The measurement probes the muon-tau symettry hypothesis that requires maximal θ23 mixing (θ23 = π/4). Assuming the normal mass hierarchy, we find Δm223 = (2.67 +- 0.11) x 10-3 eV2 and sin2θ23 at the two statistically degenerate values 0.404+0.030-0.022 and 0.624+0.022-0.030, both at the 68% confidence level. Our data disfavor the maximal mixing scenario with 2.6σ significance. 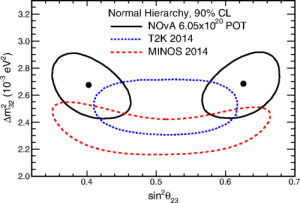 We report results from the first search for νμ→νe transitions by the NOvA experiment. In an exposure equivalent to 2.74×1020 protons-on-target in the upgraded NuMI beam at Fermilab, we observe 6 events in the Far Detector, compared to a background expectation of 0.99±0.11 (syst.) events based on the Near Detector measurement. A secondary analysis observes 11 events with a background of 1.07±0.14 (syst.). The 3.3σ excess of events observed in the primary analysis disfavors 0.1π < δCP < 0.5π in the inverted mass hierarchy at the 90% C.L. 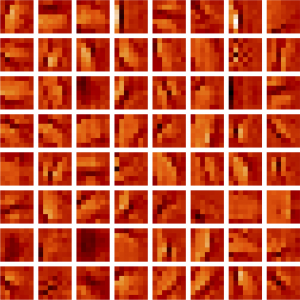 Convolutional neural networks (CNNs) have been widely applied in the computer vision community to solve complex problems in image recognition and analysis. We describe an application of the CNN technology to the problem of identifying particle interactions in sampling calorimeters used commonly in high energy physics and high energy neutrino physics in particular. Following a discussion of the core concepts of CNNs and recent innovations in CNN architectures related to the field of deep learning, we outline a specific application to the NOvA neutrino detector. This algorithm, CVN (Convolutional Visual Network) identifies neutrino interactions based on their topology without the need for detailed reconstruction and outperforms algorithms currently in use by the NOvA collaboration. This paper reports the first measurement using the NOvA detectors of νμ disappearance in a νμ beam. 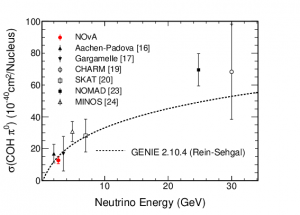 The analysis uses a 14 kton-equivalent exposure of 2.74×1020 protons-on-target from the Fermilab NuMI beam. Assuming the normal neutrino mass hierarchy, we measure Δm232=(2.52+0.20-0.18)×10−3eV2 and sin2θ23 in the range 0.38-0.65, both at the 68% confidence level, with two statistically-degenerate best fit points at sin2θ23= 0.43 and 0.60. Results for the inverted mass hierarchy are also presented. We have produced large and highly-reflective open-cell PVC extrusions for the NOvA neutrino oscillation experiment. The extrusions were sealed, instrumented, assembled into self-supporting detector blocks, and filled with liquid scintillator. Each Far Detector block stands 15.7 m high, is 15.7 m wide and 2.1 m thick. More than 22,000 extrusions were produced with high dimensional tolerance and robust mechanical strength. This paper provides an overview of the NOvA Far Detector, describes the preparation of the custom PVC powder, and the making of the extrusions. Quality control was a key element in the production and is described in detail. The NOvA collaboration blended and delivered 8.8 kt (2.72M gal) of liquid scintillator as the active detector medium to its near and far detectors. 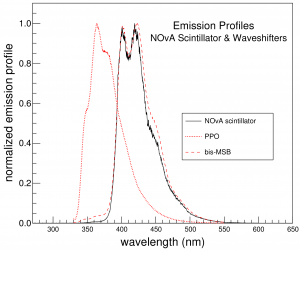 The composition of this scintillator was specifically developed to satisfy NOvA׳s performance requirements. A rigorous set of quality control procedures was put in place to verify that the incoming components and the blended scintillator met these requirements. The scintillator was blended commercially in Hammond, IN. The scintillator was shipped to the NOvA detectors using dedicated stainless steel tanker trailers cleaned to food grade. We describe the Library Event Matching classification algorithm implemented for use in the NOvA νμ→νe oscillation measurement. 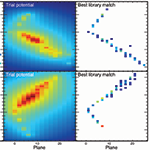 Library Event Matching, developed in a different form by the earlier MINOS experiment, is a powerful approach in which input trial events are compared to a large library of simulated events to find those that best match the input event. A key feature of the algorithm is that the comparisons are based on all the information available in the event, as opposed to higher-level derived quantities. The final event classifier is formed by examining the details of the best-matched library events. We discuss the concept, definition, optimization, and broader applications of the algorithm as implemented here. Library Event Matching is well-suited to the monolithic, segmented detectors of NOvA and thus provides a powerful technique for event discrimination.